I imagine Romans using papyrus and quills on a still table, allowing time for the ink to dry, which may not be possible in a battlefield. I once saw a documentary which depicts him walking off in solitude to write on something handheld. What was the actual medium of the battlefield manuscripts and where did he sit to write them? Did he transcribe them to better media later? We have no idea, because of an 800 year gap in the provenance of the work. Even the source codex for the original printed publication in 1559 was lost shortly afterwards. We cannot know for sure. Documentaries of that time tend not to be very accurate. 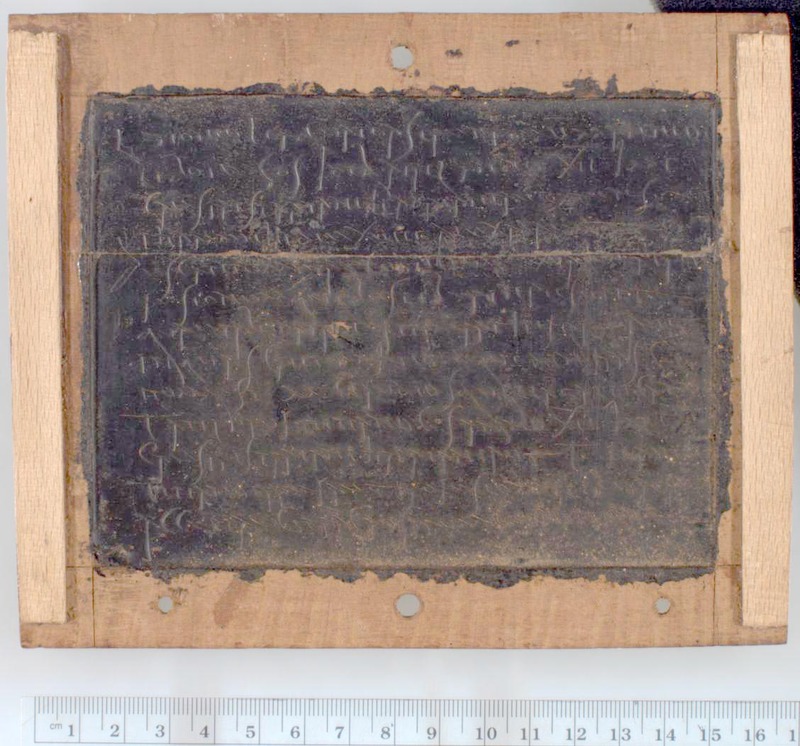 But given the general frame of "what did ancient Romans use to write on while away from a desk?" we might justly infer that it would have to be something robust, light weight, easy to write on and something without the need for a firm underground. 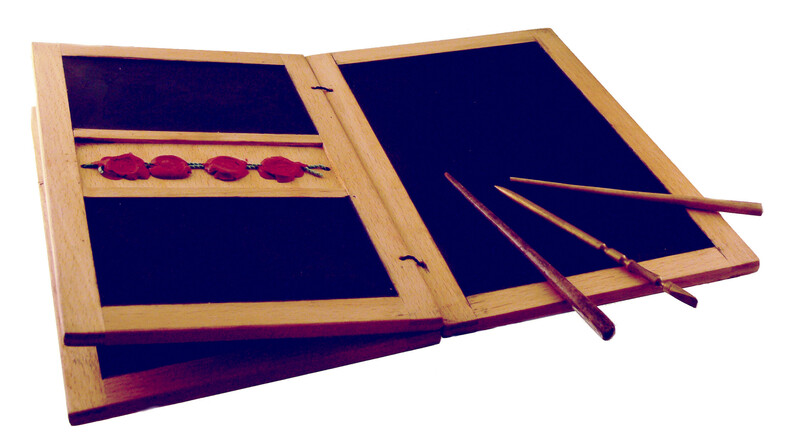 Writing on the wax surface was performed with a pointed instrument, a stylus. 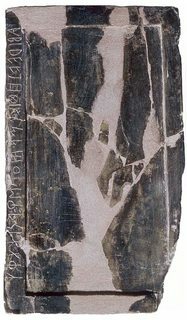 Writing by engraving in wax required the application of much more pressure and traction than would be necessary with ink on parchment or papyrus, and the scribe had to lift the stylus in order to change the direction of the stroke. Therefore, the stylus could not be applied with the same degree of dexterity as a pen. A straight-edged, spatula-like implement (often placed on the opposite end of the stylus tip) would be used in a razor-like fashion to serve as an eraser. The entire tablet could be erased for reuse by warming it to about 50 °C and smoothing the softened wax surface. The modern expression of "a clean slate" equates to the Latin expression "tabula rasa". 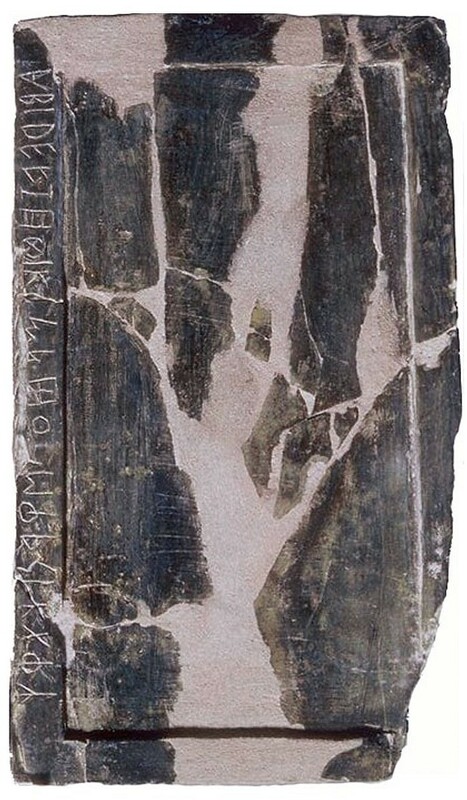 Roman scribe with his stylus and tablets on his tomb stele at Flavia Solva in Noricum Wax tablets were used for a variety of purposes, from taking down students' or secretaries' notes to recording business accounts. Early forms of shorthand were used too. 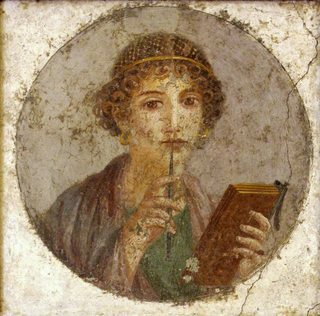 WP: Herkulaneischer_Meister_002: Tondo of Woman with wax tablets and stylus (so-called "Sappho"), National Archaeological Museum of Naples (inventory no. 9084). 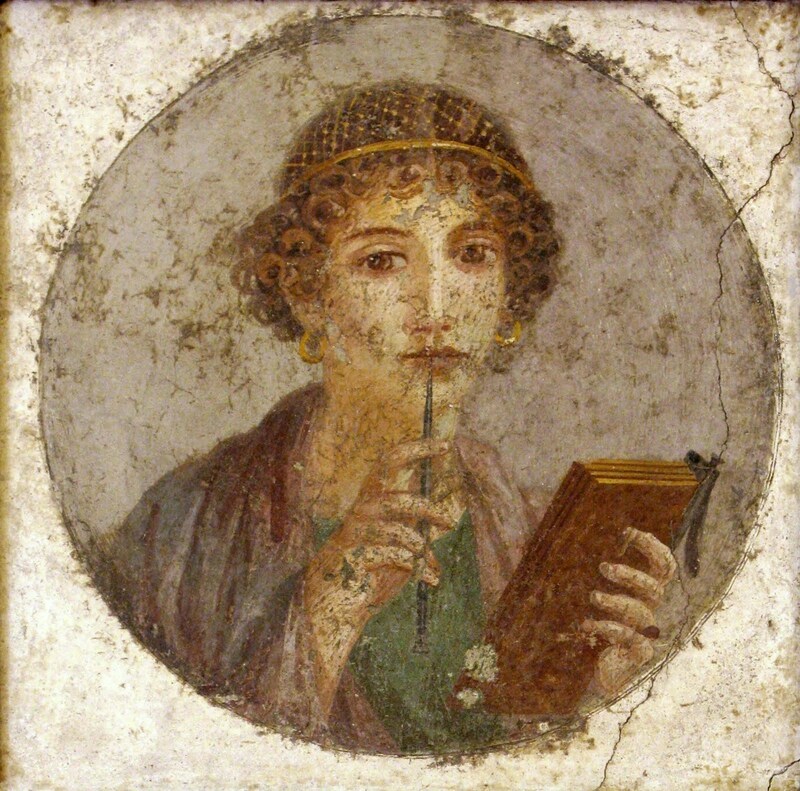 Roman fresco of about 50, from Pompeii (VI, Insula Occidentalis) - Discovered in 1760, is one of the most famous and beloved paintings, commonly called Sappho. 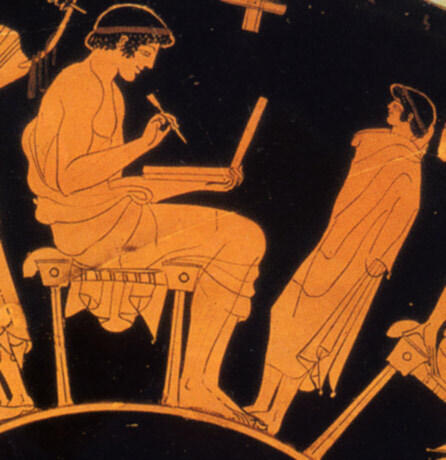 Actually portrays a high-society Pompeian woman, richly dressed with gold-threaded hair and large gold earrings, bringing the stylus to the mouth and holding the wax tablets, notoriously accounting documents which therefore have nothing to do with poetry and even less with the famous Greek writer. 1: Note the dubious history section for slate on wikipedia. The Etruscan tablet could have been used both ways: to impress the wax on it without any wax with a stilus or to directly write on it with either chalk or a stilus plumbeus (or any metal point). Not the answer you're looking for? Browse other questions tagged ancient-history roman-empire technology writing or ask your own question. Was Marcus Marcellus faced with Viridomarus or Britomartus? What computer was used in 1958 for handwriting recognition by Dimond? What was the output of a Bessemer Converter? What was the primary reason for the rise and success of the Roman republic / empire? Did Marcus Aurelius ever deliberate about his son's succession?